Married to Another Man - What is Married to Another Man Book About? 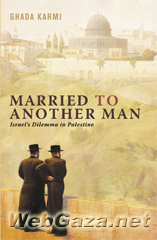 Two rabbis, visiting Palestine in 1897,observed that the land was like a bride,"beautiful,but married to another man". By which they meant that, if a place was to be found for Israel in Palestein,where would the people of Palestine go? This is a dilemma that Israel has never been able to resolve. No conflict today is more dangerous than that between Israel and the Palestinians. The implications it has for regional and global security cannot be overstated. The peace process as we know it is dead and no solution is in sight. Nor, as this book argues, will that change until everyone involved in finding a solution accepts the real causes of conflict, and its consequences on the ground. Leading writer Ghada Karmi explains in fascinating detail the difficulties Israel's existence created for the Arab world and why the search for a solution has been so elusive. Ultimately,she argues that the conflict will end only once the needs of both Arabs and Israelis are accommodated equally. Her startling conclusions overturn conventional thinking-but they are hard to refute.